In Dark Seas you are a pirate sailing the Plunder Islands looking to recruit a fearsome crew and grab all the power, glory, and gold you can get your grubby hands on. Infamy awaits! Real pirates need to actually kill people and steal stuff to make this happen. You’re just going to need to roll dice and lay tiles. Much less chance of ending up in jail this way. Before the game begins, each player sets up their playing area/island according to the instructions. 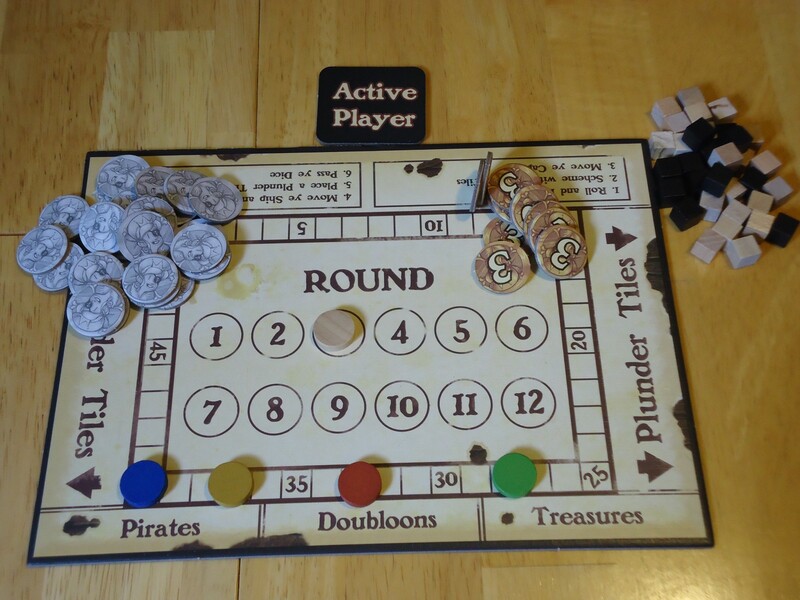 Each player is given three doubloons and randomly chooses four plunder tiles from the stacks. The other components are placed on the table within easy reach and the scoring markers are placed on the zero space of the scoring track. Once you’ve chosen a starting player, give that player four dice and begin. A turn consists of five steps. (Note that the original rules were not clear as to whether a player had to complete all five steps before the next player could go, or whether the steps could be performed simultaneously by all players. Playing in the former way led to some horrendously long games so AEG released an official errata to clarify that except for the first step, rolling the dice which is done by only one player anyway, all players may perform the steps simultaneously. Some later editions of the game may have this clarification already in the rulebook, while older editions will not.) Once everyone has completed all the steps, the round is over. A game consists of twelve rounds and this does not change based on the number of players. 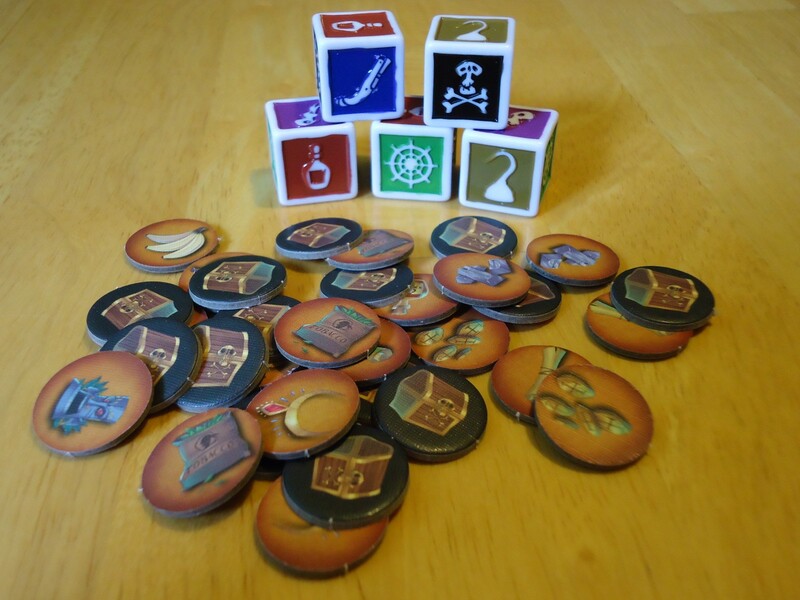 Doubloons, pirate cubes, the Active Player marker, and the score tracker. Step 1: The active player rolls all four dice. You may have one re-roll and you may re-roll as many dice as you like, but you must roll them all at the same time. You’re trying to get a roll that matches the islands you wish to move to and which allows you to use the desired plunder tiles in your hand. If your roll hurts your opponents, then that’s even better. Once the roll is set, the dice cannot be changed and all players must use these dice to complete the next four steps of the turn. Step 2: Use the scheme ability of plunder tiles in your hand. Some plunder tiles show a scheme icon on the bottom which matches one of the icons on the dice. If a die is showing that matches the icon on a tile in your hand, you may reveal the tile, claim the benefit, and then discard the tile. You may claim one scheme ability per tile and die, so if you have two tiles with blue icons but only one blue die is showing, you may only claim one benefit. Step 3: Move your captain. You may move your captain token to an adjacent port hex on the island, or from a port hex back to the central island tile. Captains cannot occupy a plunder tile. Moving the captain to a port hex allows your ship to pass through that port during the next step and may protect you from the effects of other players’ plunder tiles in step 4, as well. Moving back to the central island grants you resources, either money or a plunder tile. A starting island set up. Step 4: Move your ship and resolve plunder tiles. Ships can only move from port to port clockwise around the central island tile. You cannot skip ports and your ship can advance to the next port only if the port’s icon is shown on at least one of the dice or your captain is on that particular port hex. When your ship enters a port you may (but are not required to) activate one or both of the tiles that are adjacent to that port. (Tiles are only considered adjacent if they are touching the ships “bay water” which affects only two sides of the tile.) If you activate the plunder tile, follow its instructions. After use it remains in place and is not discarded. If, after activating any plunder tiles, you have a legal move to the next port, you may move there and repeat the activation process, moving from port to port until you are no longer allowed to do so. Step 5: Place a plunder tile. After you have completed your movement, you may optionally place a plunder tile from your hand face up onto one of the two spaces adjacent to the bay water on the port hex where your ship ended its movement. If the two spaces adjacent to the port hex are already occupied by plunder tiles, you may discard one tile and place a new one from your hand. Plunder tiles placed in in this manner do not activate until your ship moves all the way around the island and enters the port again. After the round is complete, the active player passes the dice and active player marker to the player on his/her left and that person now becomes the active player. He or she rolls the rice and begins another round. Once all twelve rounds are complete, the most infamous pirate wins the game (infamy is measured in points). You will earn some infamy during the game from various plunder tiles, but the bulk of your points will be calculated at the end of the game. Any treasures you have earn you points and the more you have that match and create a collection the more points you earn, up to a maximum of ten if you have four matching treasures. You gain one infamy point for every three doubloons that you have left. You gain one infamy point for every dread pirate that you have. Each port you have with at least one pirate on it gains you one infamy. Each port you have with four pirates on it gains you an additional one infamy. You gain infamy for any plunder tiles as noted in their text. Add it all up and the highest total is the most infamous, awesome pirate ever and the winner of the game. Everyone else gets thrown overboard. Sailing The High Seas or Swabbing The Poop Deck? I’m going to get a couple of the negatives out of the way right up front, if only because I think this game got bashed a bit unfairly when it came out with some errors. You might have heard that there was a big error with the dice. True. 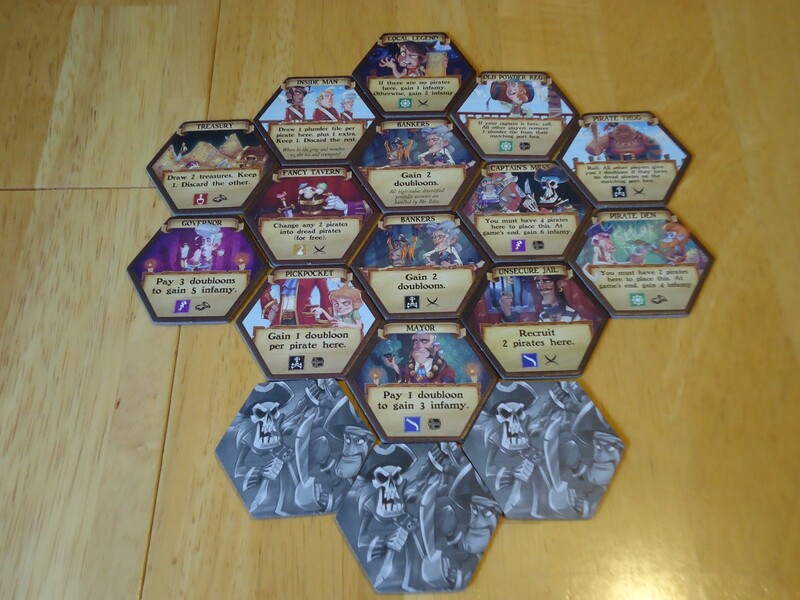 The dice have colors and symbols that are supposed to match the icons on the plunder tiles. In the first printing of the game, the colors were correct but some of the symbols were wrong. This didn’t render the game unplayable; you simply had to be aware of the error and look to the color and not the symbol. But it was annoying. AEG produced corrected dice when the error was realized. I bought the game on TableTop day (its release date) and submitted a request to AEG for corrected dice a couple of days later. They responded that it would be “a few weeks” before I received them as they were still in production at that time. In actuality, it took less than two weeks. That was some super-fast service and a great effort by the company to correct the error. I have nothing but praise for their handling of the situation. There were a couple of other errors, as well. I noted the confusion with the turn order rules above, and there was a misprint on the “Scout” tiles that could, on occasion, lead to an infinite loop in the gameplay. All of this was corrected in an official errata and I understand has been corrected in newer versions of the game. If you have one of those, you might wonder what on earth I’m talking about. Just ignore me. Some of Dark Seas’ plunder tiles. All of this led the game to get bashed upon release which I can understand, to a point. The original turn-order rules did lead to long games that took away a bit of the fun and it was confusing to deal with the dice, at least for the first couple of games. It’s not the ideal way to release a game but mistakes do get made and AEG worked hard to correct them. If you’re one of those people who can never forgive a mistake in a game, then nothing I say is going to get you to give this game a chance. However, if you can accept that mistakes were made, have been corrected, and judge the game based on its merits, then read on for the rest of the review. A lot of complaints about the gameplay center around the amount of luck involved, but I think these are misplaced. True, there is the luck of the die roll plus the luck of the tile draw and if you hate any kind of randomness, then you’re going to hate Dark Seas. If the dice roll your way and you get plunder tiles that allow you to chain together a strong resource generating engine, yes, you can theoretically run away with the game. However, almost no one has this kind of luck. The nice thing is that the luck tends to even out. You may really take a beating during a round, but a couple of rounds later everything flows your way. Over twelve rounds you’re almost guaranteed to have some good ones and bad ones, and so is everyone else. Another plus: The game is highly re-playable since it never plays out exactly the same way. You’ll always have different tiles and dice rolls to work with. The luck is also thematic. Pirates need a lot of luck to be successful in their pillaging. You need strong wind for sailing. You need bribable officials, not fine upstanding citizens. You need the treasure to be there when you dig it up. And on and on. The life of a pirate is blessed or cursed by chance and this game is no different. Helping to mitigate the luck factor even further is the fact that there are multiple ways to earn points, so you’re almost never without an option. Do you try to recruit more pirates? Make more money? Schmooze high ranking officials for more infamy? Move your captain to help your movement on the next turn or to immunize yourself against negative plunder tiles from other players? There are choices to be made in Dark Seas, but they’re not easy to plan for since you have to wait for the dice roll before you know what you can do. But once you see what’s available, there are options to sort through. The dice (shown are the corrected dice) and treasure tokens. The theme isn’t as engrossing as say, Merchants and Marauders, but for the weight and length of game that this is, there’s a fair amount of theme here. The art is cute and cartoony and the pirate ship and captain tokens are a nice touch. Reading the plunder tiles is amusing. Dark Seas doesn’t feel like you’re truly captaining a ship through the Caribbean, but it does feel a bit like reading a pirate comic book. Those who appreciate their pirates a bit silly and whimsical instead of cutthroat and nasty will like Dark Seas. The two or three player game is the best way to play, in my opinion. The four player game is played in teams, according to the errata, which moves it along faster and cuts the downtime, but also waters down the experience since you’re sharing the limited decisions with your teammate. This is fine if you’re playing as a party game and you want to increase the interaction, but the more strategic experience is found at the lower player counts where you’re totally responsible for creating your own island and building your own engine. Yes, it plays like multiplayer solitaire with only minimal interaction, but it is fun to try to think ahead and imagine what your best case scenario plan might be. Bonus: There is very little meanness in the game. There are a few tiles that allow you to mess with an opponent, but not that many. 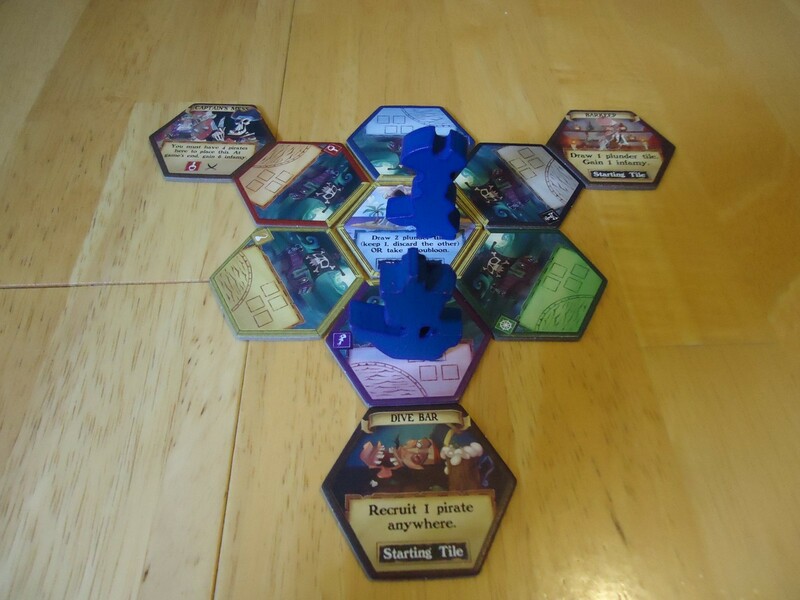 Dark Seas is good for those who don’t like a lot of “take that” in their games. All in all, Dark Seas is a solid offering in the pirate genre. If you’re looking for a light pirate game to play with family or as a filler on game night, this could be a winner. I’d put it close to Jamaica in terms of complexity and challenge. It scores high on the “go again” meter largely because it feels like by the time you really get your engine rolling, the game ends. It doesn’t last so long that you’re sick of it by the end. If you’re looking for a heavy, decision-laden, thematic pirate game, you’ll be happier with Merchants and Marauders. 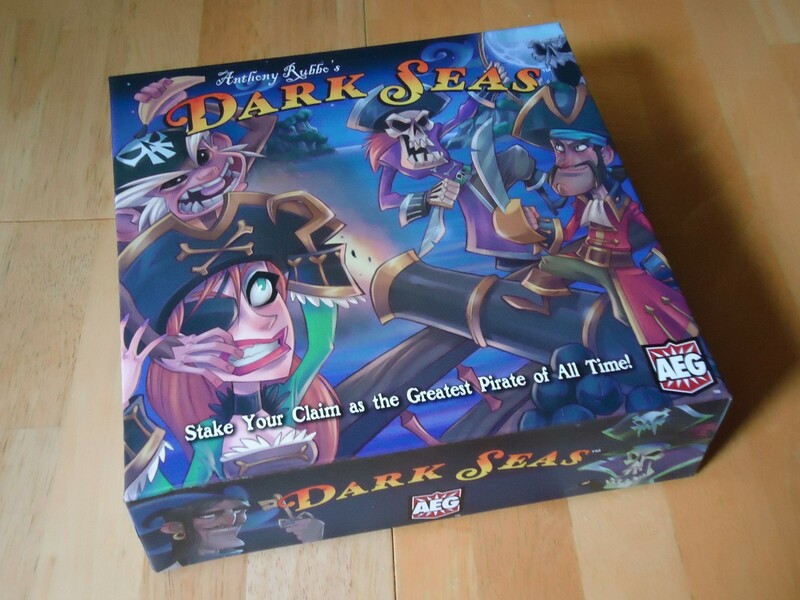 But if you like dice, randomness, whimsy, and a quick, light adventure through pirate land, give Dark Seas a try. Cute cartoony artwork; suitable for family settings. AEG is super fast about providing corrected dice if you get a misprinted version. The adjusted rules make for a quick, light game with almost no downtime. Great two or three player experience. Lighthearted, humorous fun for beer and pretzels nights, or light gamers. Has a "what goes around comes around feeling" and the bad luck evens out over the game. Very little "take that" to offend sensitive players. AEG had to release a brief errata to clear up some misprints and confusion. Since all players are working through the turn simultaneously, it's multiplayer solitaire with little interaction. Dice and tile draw make this a luck-driven game. Those looking for heavy strategy game won't find it.